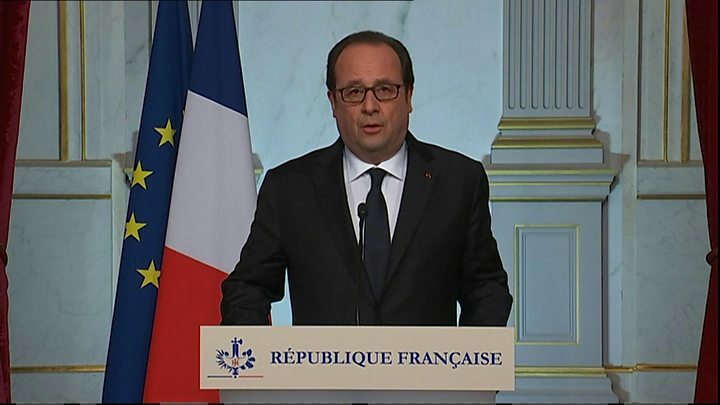 President Francois Hollande, who is in Nice, said the attack was of "an undeniable terrorist nature". He said the battle against terrorism would be long as France faced "an enemy who will continue to hit countries who see liberty as their essential value". A state of emergency, in place since November's Paris attacks carried out by militants from the so-called Islamic State group, in which 130 people died, has been extended by three months. The attack in Nice began shortly after the end of a firework display on the seafront for Bastille Day, which is the country's national holiday. "I heard lots of screams and everybody was running in different directions. I didn't know what was going on, it felt surreal and I didn't move but thought it must be some kind of practical joke. "Then I saw the truck coming straight at me swerving all over the place. It was perhaps 50 yards away. After that there was no conscious thought, my body took over, time slowed down and I ran and thank God I got out of the way," said Pouya, from Toronto. Media captionWitness Colin Srivastava: "Police said: Run, now"
Nader el-Shafei told the BBC he saw the driver face-to-face for about a minute: "He was very nervous… looking for something around him, I kept yelling at him and waving my hands to stop... he picked up his gun and started to shoot police." 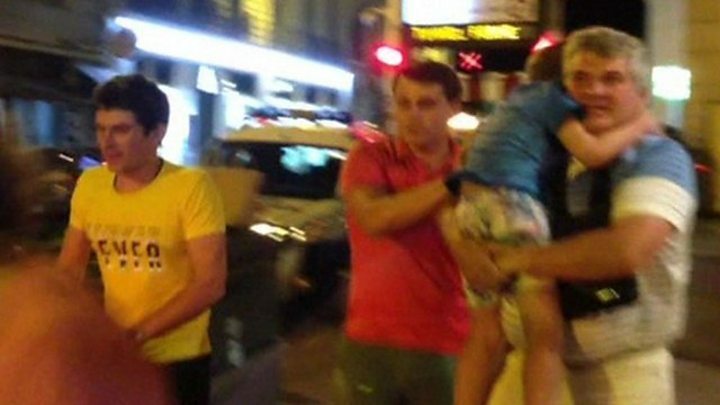 Tourists and residents of Nice were among those who died. Two American citizens, a Ukrainian, a Russian and a Swiss woman are among the 84 victims. Mr Hollande said 50 injured people were in a critical condition "between life and death". Many of the victims were foreigners, he said. 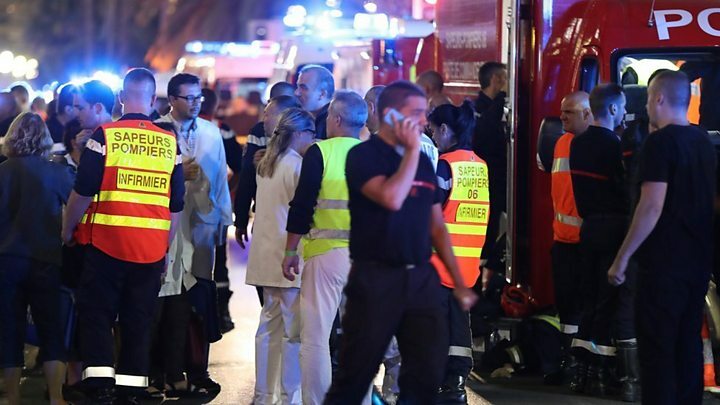 Fondation Lenval, the children's hospital in Nice, says it has treated some 50 children and adolescents, including two who died during or after surgery. This is not the first time in recent years that someone has deliberately driven a truck into pedestrians on a French street. But the scale, speed and death toll from this apparent attack are unprecedented. It follows an earlier call by so-called Islamic State (IS) spokesman Abu Muhammad al-Adnani for IS followers to do exactly what this truck driver did. This, and other calls for attacks in Europe, are partly in response to the significant losses being experienced by IS to the shrinking territory it controls in Syria and Iraq. US-led airstrikes, including by French warplanes, are taking a particularly heavy toll there. At home, France has become the number one target of opportunity for IS and its supporters, unperturbed by the national state of emergency that has just been extended. Media captionWill Shore, eyewitness: "You could see the fear in people's faces"
No group has so far said it was behind the attack. 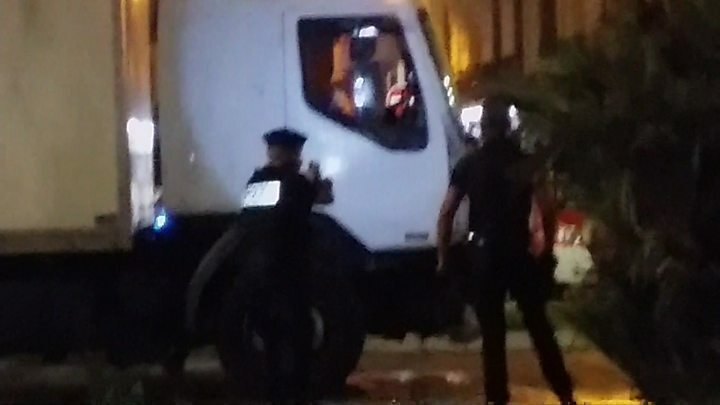 The identity papers of a 31-year-old French-Tunisian were found in the lorry, which was reportedly rented out two days earlier in the suburb of Saint-Laurent-du-Var. The man has been named by local media as Mohamed Lahouaiej-Bouhlel, although not by police. Tunisian security sources said he was married with three children and came from the Tunisian town of Msaken. He visited Tunisia frequently, the last time eight months ago. He reportedly lived on the Route de Turin in Nice and had been in trouble with the police in the past for petty crime, but he was not on the watch list of radicalised young men. Residents of his apartment building said he was a loner who did not respond when they said hello. Read more: Who was the Nice attacker? Media captionFrancois Hollande: "Horror has come down on France once again"
US President Barack Obama condemned "in the strongest terms" what he said appeared to be "a horrific terrorist attack in Nice"
UK Prime Minister Theresa May said she was "shocked and saddened by the horrifying attack in Nice"